Conveniently just off I-75 all non-smoking and offering a free breakfast every day La Quinta Inn and Suites Port Charlotte is just the ticket for our guests on the go. This 81-room hotel on three floors offers free high-speed internet access and all rooms have a microwave refrigerator free local calling and a flat-panel HDTV with cable. The hotel provides a free expanded continental breakfast buffet and a business center. After a hard day of driving working or touring the area the fitness center and outdoor heated pool are just the thing to help you stay in shape and lose the stress. Parking is free and pets are welcome with certain restrictions. 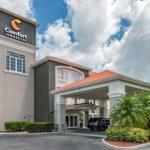 La Quinta Inn and Suites Port Charlotte is 10 minutes from Charlotte Harbor which offers deep-sea fishing a swimming complex restaurants and shops. Fishermen's Village offering more waterfront shops and dining is 20 minutes from the hotel. The Peace River offers kayaking through one of the area's beautiful natural waterways. Charlotte County Airport is 12 miles and Southwest Florida International Airport is 45 miles. Dogs up to 50 pounds are allowed for a $50 refundable deposit; there is a pet policy to sign at check-in. Dogs may only be left alone in the room if they are left in the bathroom.